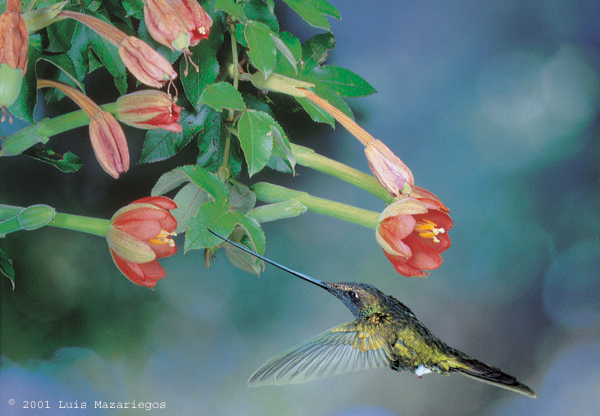 Hummingbirds, often known as ‘hummers’ are pollinators for many plants including Brugmansia, Datura, Fuchsia & Passiflora. There are over 330 species & they are closely related to swifts. They are found only in the Americas, especially up in the Andes & also in the Caribbean. They have proportionally the largest brains, longest tongues, smallest eggs & largest hearts in birds & although we think of them as being very small some are up to 8” long. Even in the wild they are thought to live ten years or more. These colourful birds are unique in their ability to hover and fly backwards or even upside down, thus being able to drink nectar & catch insects on the wing. Hovering is achieved by rotating the wings alternately backwards & forwards so that upward lift & forward thrust are balanced by downward lift & backward thrust. The wings can beat 60 times per second, creating the ‘hum’. Daytime body temperature of 102°F to 108 °F which drops right down at night to near air temperature to conserve energy. At this time heart rate can drop to 50 beats a minute. It can take up to an hour for them to ‘get up’ in the morning. They can breathe up to 250 or more times a minute & heart rate varies from 1,260 to 2,000 beats per minute. Often forked, their very specialized long tongues with many tiny hairs are curled into a tube shape to make use of capillary action. They flick their tongues at high speed repeatedly many times a second into the floral tube to reach the nectar. 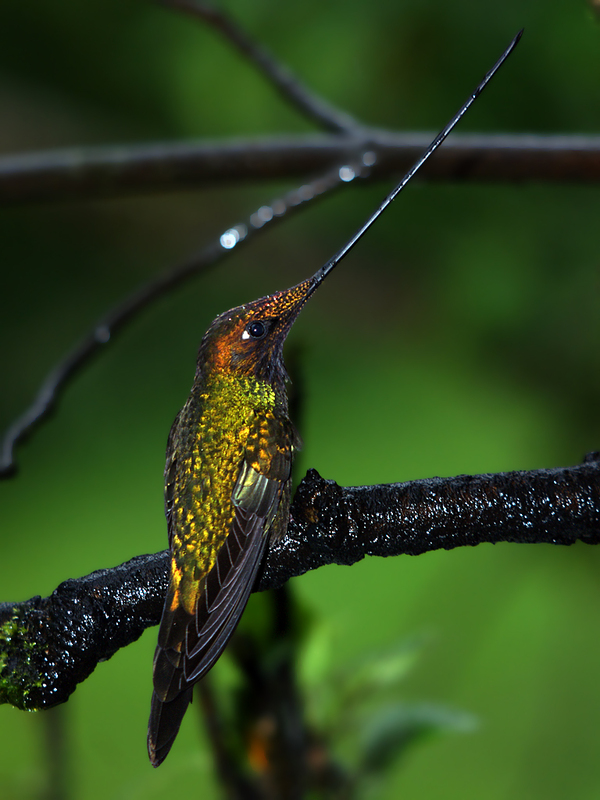 Those with the longest beaks & tongues can reach down long floral tubes that others cannot & so avoid competition. The tongues, on average, have the ability to extend as far beyond the beak as the beak is long. Some hummers are “nectar robbers” and enter a hole at the base of the floral tube that has been made by bees, wasps, or other insects who are known to use that technique, stealing the nectar without repayment by pollination. As anyone who has put out feeders for them will know, some are very aggressive, solitary & territorial birds. This is because in the wild nectar sources are always temporary by their nature & must be defended. The iridescent throats of many of the male species are to attract the female & keep other males away. Males will mate with any female & the female brings the offspring up on her own. Many hummingbirds in North America migrate in winter to Central America, a distance of nearly 2000 miles covered in one to two weeks at up to 25mph when flying. Nevertheless its not a bad life, Schuchmann 1999 found that 70% of a hummingbird’s time is spent doing little else than singing, self-preening, and sunbathing! 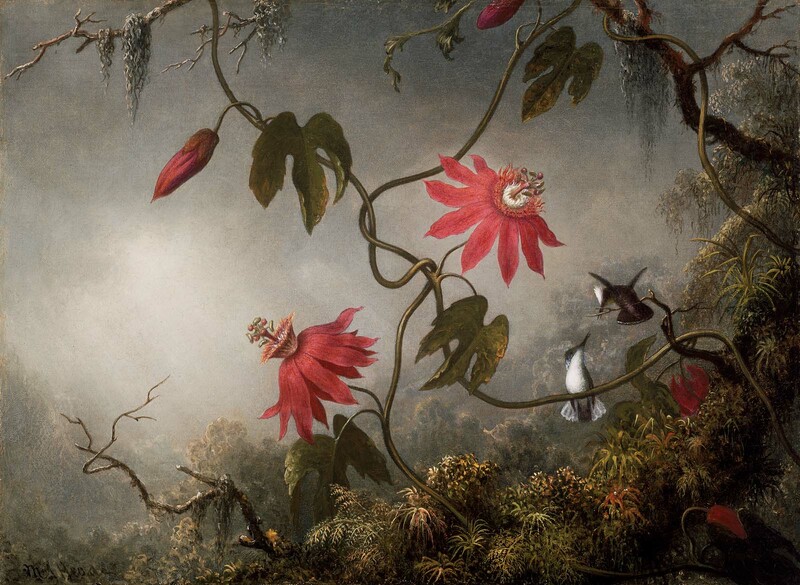 Some Passiflora with long floral tubes that do not readily self pollinate have become overdependent on specific hummingbirds to pollinate them. For the best example of this see a paper by Annika Büchert Read more. E.ensifera has a 4” beak which is longer than its body (excluding the tail) & is the only bird in the world with such proportions. At rest it sits with its beak held up vertically to reduce neck strain. It is found between 1700-3500m, it is commonest at 2500-3000m, & is sedentary. It lives in humid to semi humid upper montane forest and forest edges, sometimes at patches of of shrubs in the Páramo. Páramos are zones of elevation found in the Andes of Colombia, Ecuador, Northern Peru & Venezuela. They have a very difficult & variable, though not extreme, climate, often ranging daily from wet, cold & windy to sunny & warm. It is known to feed from flowers with long pendant floral tubes including probably Brugmansia, Columnea, Datura sanguinea, Datura tatula, Fuchsia, Passiflora mixta , P. parritae, P. tripartita var. mollissima, P. tarminiana, P. pinnatistipula, Salpichroa & Solanum. When it feeds its neck or head will be dusted with pollen & sometimes it will perch below the flowers when feeding. As nectar is low in protein it also feeds on insects, catching them in the same way as a swift in flight. Many hummingbirds are under threat but, although there is no reliable information on breeding, it is thought to be relatively common. It’s adaptation is so extreme that it can reach nectar in plants that no other bird can. There is some evidence however that global warming is causing birds to move to higher altitudes to control their body temperature. If it suddenly moves from an area those Passiflora with very long floral tubes that are unable to self pollinate will be in trouble. Lanny Chambers has advised me that E. ensifera is the most likely pollinator of the very large flowered P. parritae which may now be near extinct in the wild. Tacsonia are notoriously heat sensitive & as well as losing their pollinators they may be simply unable to survive in warmer conditons. They may depend on their fruit being eaten by animals & seed being dispersed to higher cooler conditions. A very fragile existence! This represents a scan of the skeleton of a Sword-billed Hummingbird (Ensifera ensifera), a species of the South American Andes, mostly above 2500 m elevation. This is the only bird species in which the bill is longer than the rest of the bird. 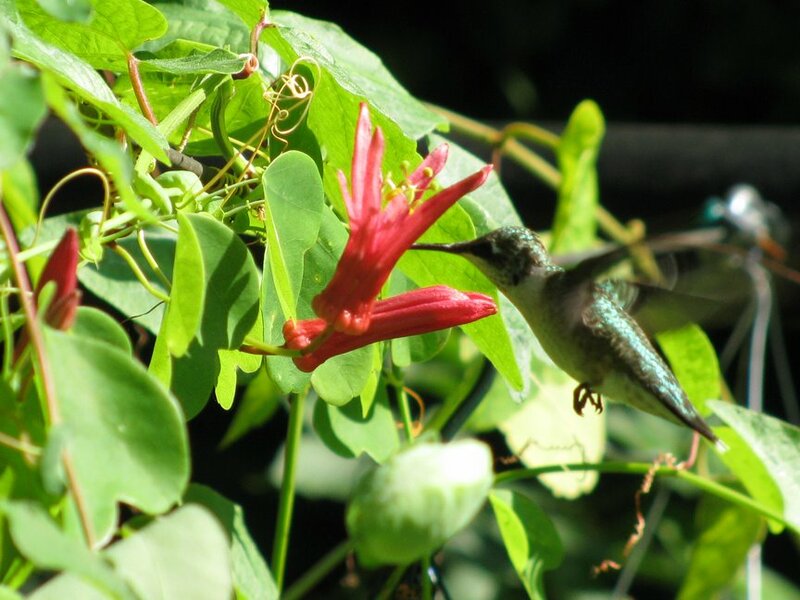 It is highly adapted to feed on flowers with very long corollas, for example species of Brugmansia, Passiflora, Datura, and Fuchsia, among others. Most of these flowers hang straight down, and the hummingbird comes up from below to feed on their nectar and pollinate them. The tongue, of course, has to be very long to accomplish this, and the tongue (hyoid) bones are also shown in the scan, above the bill. You can see where the base of the tongue bones wrap around the skull, and you can also see the posterior end of one of these bones above the bill base. The lower mandible is broken off at the tip. Hummingbirds are rather unusual birds in the relatively large size of their sternum. Note that it makes up much of the volume of the body skeleton and has a very large keel for muscle attachment. In this species especially, you can imagine that very powerful flight muscles are needed to propel that bill across the landscape! I would assume it has well-developed neck muscles as well. Also note the wing bones; what you see are the bones of the hand, relatively very large in hummingbirds because most of the flight surface of the wing is taken up by the primaries, which attach to the hand. In a bird wing, the primaries are the source of thrust, and hummingbirds depend on thrust for much of their flight; the lift provided by the inner wing feathers in most birds is of little importance to hummingbirds. Skeletal scan and text courtesy of Dr. Dennis Paulson, Director of the James R. Slater Museum of Natural History © 2001, University of Puget Sound. All rights reserved.